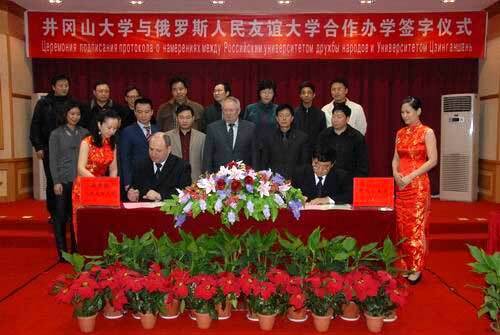 On the afternoon of April 6, 2010, Jinggangshan University（JGSU） and People’s Friendship University of Russia(PFUR) held a signing ceremony at the New Training Centre of JGSU. President Zhang Taicheng and Vice President Denisenko Vladimir Nikiforovich, on behalf of JGSU and PFUR respectively, signed up on the agreement. 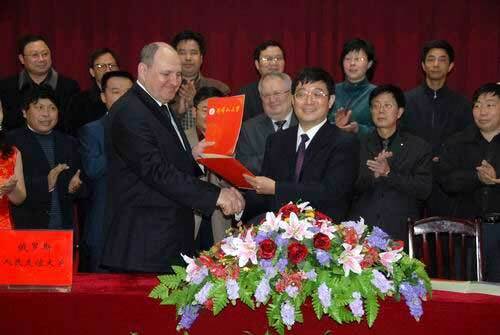 Luo Xuewei, Vice President of JGSU, presided at the signing ceremony. Present at the ceremony are Vice-president Zeng Jianping, Lv Yuhua(member of CPC Committee of JGSU), Professor Ponomaryov Nicholas Konstantinovich from PFUR, Liu Xin(Director of Beijing Office of PFUR), and leaders of relevant administrative departments of JGSU. The major contents in the cooperation agreement include: both sides agree to promote an interschool cooperation and to establish friendly universities; both sides build a sound mechanism to promote personnel exchange and communication; PFUR helps JGSU establish a Russian Teaching and Research Section; JGSU encourages its teachers to study for Master’s or Doctoral Degree in PFUR; both sides jointly boost academic exchanges and gear up students exchange program; PFUR offers students of JGSU privileged opportunities for studying for Master’s Degree at PFUR; both sides agree to conduct the Summer or Winter Camp program for the students. People’s Friendship University of Russia, founded by former Soviet leader Khrushchev, ranks the third among Russian state-run universities. It has more than 28,000 enrolled students, among which there are above 5,000 international students, government-sponsored or self-funded, from more than 100 countries and regions. 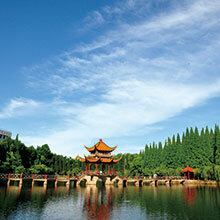 It has cultivated a number of outstanding talents for many countries in the world over 50 years since its foundation.